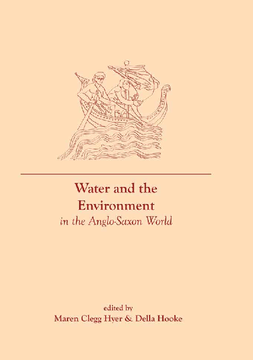 Similar in theme and method to the first and second volumes, Water and the Environment in the Anglo-Saxon World, third volume of the series Daily Living in the Anglo-Saxon World, illuminates how an understanding of the impact of water features on the daily lives of the people and the environment of the Anglo-Saxon world can inform reading and scholarship of the period in significant ways. In discussing fishing, for example, we learn in what ways fish and fishing might have impacted the life of the average person who lived near fishing waters in Anglo-Saxon England: how fishing affected that person’s diet, livelihood, and religious obligations, as well as how fish and fishing waters influenced social and cultural structures. Similar lines of enquiry in the volume’s chapters shed insight on water imagery in Old English poetry, on place names that delineate types of watery bodies across the Anglo-Saxon landscape, and on human interactions (poetic and otherwise) with fens and other wetlands, sacred wells and springs, landing spaces, bridges, canals, watermills, and river settlements, as well as a variety of other waterscapes. The volume’s examination of the impact of water features on the daily lives of the people and the environment of the Anglo-Saxon world fosters an understanding, in the end, not only of the archaeological and material circumstances of water and its uses, but also the imaginative waterscapes found in the textual records of the Anglo-Saxons. Dr Della Hooke is an Associate Member of the School of Geography, Earth and Environmental Sciences in the University of Birmingham, editor of 'Landscape History' (the journal of the Society for Landscape Studies) and editor of the 'Birmingham and Warwickshire Archaeological Transactions'. She specializes in studies of the development of the historical landscape in England and Wales, especially in the early medieval period. Her recent publications include 'England’s Landscape: The West Midlands' (English Heritage/HarperCollins 2006) and 'Trees in Anglo-Saxon England: Literature, Lore and Landscape' (Boydell 2010). Dr Maren Clegg Hyer is Associate Professor of English at Valdosta State University (Georgia). She specializes in researching textiles and textile imagery in Anglo-Saxon culture. Some of her recent publications include 'The Material Culture of Daily Living in Anglo-Saxon England' (edited with Gale R. Owen-Crocker, Exeter 2011); 'The Material Culture of the Built Environment in the Anglo-Saxon World' (edited with Gale R. Owen-Crocker, Liverpool 2015); and 'Textiles, Text, Intertext: Essays in Honour of Gale R. Owen-Crocker' (edited with Jill Frederick, Boydell 2016), including a chapter in that volume, "Text, Textile, Context: Aldhelm and Wordweaving as Metaphor in Old English." Dr Maren Clegg Hyer is Associate Professor of English at Valdosta State University (Georgia). She specializes in researching textiles and textile imagery in Anglo-Saxon culture. Some of her recent publications include 'The Material Culture of Daily Living in Anglo-Saxon England' (edited with Gale R. Owen-Crocker, Exeter 2011); 'The Material Culture of the Built Environment in the Anglo-Saxon World' (edited with Gale R. Owen-Crocker, Liverpool 2015); and 'Textiles, Text, Intertext: Essays in Honour of Gale R. Owen-Crocker' (edited with Jill Frederick, Boydell 2016), including a chapter in that volume, "Text, Textile, Context: Aldhelm and Wordweaving as Metaphor in Old English." Dr Della Hooke is an Associate Member of the School of Geography, Earth and Environmental Sciences in the University of Birmingham, editor of 'Landscape History' (the journal of the Society for Landscape Studies) and editor of the 'Birmingham and Warwickshire Archaeological Transactions'. She specializes in studies of the development of the historical landscape in England and Wales, especially in the early medieval period. Her recent publications include 'England’s Landscape: The West Midlands' (English Heritage/HarperCollins 2006) and 'Trees in Anglo-Saxon England: Literature, Lore and Landscape' (Boydell 2010).